I'm neither a beauty guru nor make up artist nor any of that sorts... just a normal human being writing an own opinion on stuff. So, living in the land of nowhere here, I found the famous "Lush" store. Always heard about it, visited it twice before but never bought cause of the exaggerated prices; anyway I decided to try out a bunch of things. Not sure if the shop girls are advised to talk at the speed of light and try to sell you as much as possible or if they're all high on the smell inside the store. I got this because due to all the dish washing and hand washing of clothes AND the icy cold outside my hands had tons of little cracks and looked just 50 years older than the rest of me. 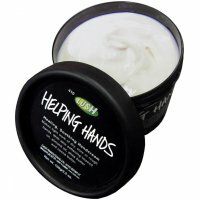 Already after using it twice, many of the little cuts started healing and my hands looked way smoother than before. The smell is very "natural" but I wouldn't say it's bad, it's just very light and after the cream is absorbed, you will not smell it anymore. I recommend applying the cream, wearing gloves and let it "soak" overnight. Many people have been raving about the smell of this mask saying "it's JUST like cupcake batter"...well.. I don't really think so. It has an amazing smell and my whole room smells of it when I use it but it's not actually like batter, although it makes you want to dig a spoon in it and eat it. Well there isn't too much to say about it, it's a sugar scrub, it works like a charm. It's especially great before applying lipstick cause it evens out the lips making them really soft and smooth. 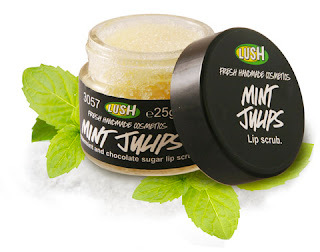 The thing I love about this is that once you rub it on the lips you don't need to wipe it off or rinse them... just lick it off :) it's minty sugar !! This is the thing that disappointed me A LOT ! It's a hair mask and well.. first of all you're supposed to apply it on DRY hair.. which makes it really strange and my hair felt super dry when I washed it out. I used it another 3 times and yeh, not impressed. The smell is very very strong, I loved it and again, like the cupcake mask, my whole room smelled of it. It's a very spicy scent because of the cinnamon and cloves.. you either love it or hate it. Anyway.. not a major fan of this mask, not gonna buy it again. Yesterday I got some more stuff but I haven't used either of the things so I will probably review them another time. Hope you enjoyed this completely different post from me.